Golden Delicious × Jonathan, 1943, released 1968, Geneva, New York, USA. Vigorous, more suitable for cool climate. Granny Smith, Delicious. Triploid variety, so will not reciprocate with pollen for pollinator variety. Red strains flower at same time but will not cross-pollinate each other. Attractive bright red striped, waxy, but colour in the middle of the tree can be pale; needs good light penetration for good colour. Late summer pruning can help colour. Creamy, well-flavoured flesh; very fine taste, rough texture, crisp and juicy. Heavy cropping, single fruiting; does not normally need thinning. Good; shelf life may not be long if left too long to colour. Some bitter pit; can be calcium-deficient. Crowngold - Patented by Flemings. Branch sport at Brogdale, Kent, UK. More solid bright red than normal Jonagold; paler at East Malling than some other red strains; bright red with dashes of darker red, otherwise similar to Jonagold. Jonagored - Patent by Flemings. Limb sport of Jonagold 1985 from Jos and Rose Morren, Halen, Belgium. Colour tends to be brownish 3 weeks before harvest, but this changes to an attractive bright solid red with a slight stripe, one of the best colours; original was stripey but now is smooth red flush, similar to Rubinstar, otherwise similar to Jonagold; can suffer from sunburn and lack of flesh texture if grown in hot areas. New Jonagold - Patent by Flemings. Mutation of Jonagold, M. Saito, Aomori Prefecture, Japan (patent). Deep red stripe but slightly redder overall than Jonagold and brighter; superseded by Jonagored, slightly earlier than Jonagold; susceptible to bitter pit and sunburn; may need multiple picking. Rubinstar - Patent by ANFIC. Bud sport of Jonagold (very stable) at Gaiberg, Germany in 1980. 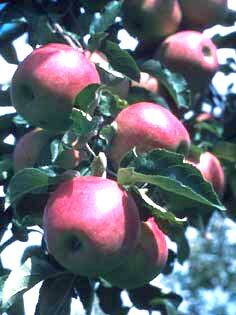 More intense red over 70–90% of surface with little or no stripe; shorter shape, similar to Jonagored, matures about a week earlier. Wilmuta - Patent by Flemings. Heat treated 2361, Gilles, Belgium, named at Wilhelminadorp, Netherlands. Very similar to New Jonagold; bright red with dashes of darker red.